An excellent attendance of 545 were on hand to watch Burton Park Wanderers beat Sileby Rangers 2-0 at Latimer Park in their first Future Lions United Counties League Division One home match since the club stalwart’s death last week. 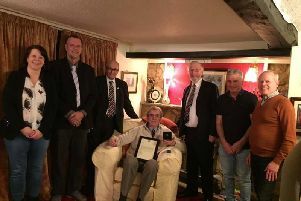 ‘Bo’ passed away after illness and left behind a 50-year legacy at Wanderers where he served in numerous roles including chairman, manager, player, coach and groundsman while he also played a pivotal role in the formation of Kettering FC in 2012. And the game had a fitting outcome as first-half goals from Brian Farrell, with a fine header, and Jurelle Philips gave Wanderers, who were captained by local Burton Latimer boy Sam Hearn, victory. The club offered free entry and refreshments for all while the Wanderers squad warmed up in t-shirts which had a picture of Bo on there with the words ‘Mr Burton Park’ while the shirts they wore for the match itself contained the wording ‘Bo - 1940-2019’. “On the pitch, we just wanted to do Bo proud and I think the players thrived on the attendance. “Everyone there would have had their own stories about Bo. But from my point of view, when I first went into the UCL with Peterborough Northern Star, it was Bo who gave me advice about the league and how to deal with it.